Overview: The Jade Tree is an evergreen succulent native to South Africa where it can reach heights of 2 metres or more. In temperate zones Jades are regarded as indoor trees and should not be subjected to temperatures below 5-7 degrees centigrade (41-45 F). The Jade has a thick trunk and branch structure with thick elliptic green succulent leaves. Given sufficient light the leaves develop red edges to their leaves and produce clusters of star-shaped white flowers in Autumn. Natural leaf size is 1-2" but can be reduced to as little as 1/2" with regular pruning. The Jade Tree is suitable for informal upright and clump styles in all sizes. General Cultivation: Jades should not be exposed to temperatures below 5-7 degrees centigrade and as a result are commonly grown indoors, though in warmer climates outdoor placement during summer is beneficial. Indoors, Jades should be placed as close to a natural source of light as possible, they will cope with poor light conditions though this will result in poor growth rate and increased leaf size. Due to their arid natural habitat, Jade Trees are capable of holding large quantities of water in their leaves. Over watered specimen develop poor root systems which become incapable of physically supporting their heavy foliage and become top heavy. 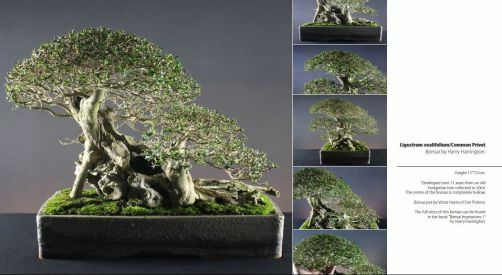 Unlike other bonsai species, Jade should be lightly watered, if the compost is allowed to dry in-between waterings the roots are encouraged to search for moisture creating a far stronger and vigorous root system. This also reduces the store of water in the foliage reducing the tendency to be top-heavy. Water is only essential to the plant when the leaves start to develop a wrinkled texture. In winter this can mean watering as little as once every 2-3 weeks. Repotting: Jades should be repotted into fast draining inorganic compost every 2-3 years. Fertilization: Stronger light encourages more vigorous growth than the use of fertilizers alone, a balanced feed once a month from mid-spring to Autumn is all the nutrients Jades require. Pruning: New growth should be continually pinched out to encourage stronger lower growth and to reduce leaf-size. Jades readily make new growth from wounds and individual leaves can be removed to quickly produce new branches. Never seal pruning wounds; wound sealents can trap moisture within the wound site and cause rotting. Leave pruning wounds open and allow to dry naturally. Jades respond very well to trunk reduction techniques, producing new growth from the wound area within 1-2 weeks. Wiring: Most enthusiasts don't bother wiring crassula, it simpler to shape this species by clipping and growing. however, Jades do respond to wiring, setting into new positions within 3-4 weeks depending on the vigour of the specimen. Beware though, as the bark marks very easily and can snap if bent too far. Wire loosely and bend branches a little at a time. Do not water the plant before wiring as turgid branches are far more likely to snap and mark. Propagation: Cuttings can be taken at any time in sandy, well-drained compost. Even single leaves laid on the surface of the compost will strike.